If these missionaries play their cards right, they could have another two discussions just like this one (well, maybe only one more discussion). 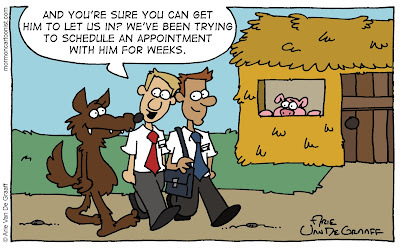 I think it would have been funnier with the wolf as one of the missionaries knocking on the door. "Why is it that I never have any luck tracting in this neighborhood?" Just thought of this: the missionaries should teach the three little pigs the parable of the wise man and the foolish man! Great ideas! I hate it when my readers are funnier than me.